Department of Food Science and Technology, University of Agriculture PMB 2240, Abeokuta, Ogun State, Nigeria. An investigation was conducted to determine the quality and consumer preference for "lafun" (cooked fermented cassava flour) made from different cassava varieties. The cassava varieties which were fermented to produce 'lafun' in this study three newly introduced varieties namely TMS 30572, TME1, TMS 4(2)1425 and one local variety which is called "Isunikankoniyan". There was no significant difference in the physico-chemical changes of the cassava varieties as a result of the 96 hours fermentation process. The fermentation process effected increases in the total titratable acidity and decreases in the total sugars, starch, ash, fat, fibre and protein contents of the root. However, significant reductions in fibre was found with TMS 4(2)1425. There were significant differences in the cooking characteristics of the fermented flour made from different cassava varieties. The flour from the local variety, "Isunikankoniyan' gelatinizes faster than the new varieties., while Cassava clone TMS 4(2)1425 requires significantly higher heating to gelatinize. Except for the flour of Cassava clone, TMS 4(2)1425, , there was no significant difference in the viscosity of the cooked cassava flour from the tested varieties. The cooked fermented cassava flour ('lafun" made from the local variety, 'Isunikankoniyan' and Cassava clone TME 1 were most preferred. Cassava [Manihot esculenta Crantz] is an important staple food crop for millions of people in the tropics (Rao and Hahn, 1984). Cassava root is normally processed before consumption as a means of detoxification, preservation and modification and various fermented cassava products are available including 'gari', 'fufu' and 'lafun' (Oyewole, 1991]. 'Lafun" is produced through the submerged fermentation of peeled cassava roots in water [Oyewole and Odunfa, 1988]. After fermentation, the fermented cassava is subjected to sun-drying and milled in order to have 'lafun' flour. The flour is usually turned in boiled water , with no extra heating, and made to a stff porridge which is consumed with soup. Cassava roots used for this work include two of the cassava varieties developed by the International Institute of Tropical Agriculture [IITA] , Nigeria namely TMS 4(2)1425 and TMS 30572 and two local varieties namely TME 1 and "Isunikankoniyan'. They were obtained from the farms of the Institute of Tropical Agriculture, Ibadan, Nigeria and were about 10-12 months old at the time of harvest. Harvested cassava roots were peeled and soaked in water to ferment for 96 hours as described by Oyewole and Odunfa . The fermented root was then sun-dried for two days before being milled to flour. Titratable acidity and pH were assessed using the method of Lees (1975).The methods of AOAC (1984) were used for assessing the ash, crude, moisture, fat and crude protein contents. The cyanogenic potentials of the cassava roots were assessed using the method of Rao and hahn (1984), while the procedures described by Dubois et al., (1956) was followed for the starch and free sugar analysis.. The pasting properties of the fermented cassava flours were assessed using the rapid visco-analyzer as described by Deffenbaugh and Walker (1989). The fermented cassava flour ['Lafun'] was cooked by turning the flour in boiled water [flour /water ratio of 1:4]. The water was brought to boil on a gas cooker in a pot. The flame was put off and the cassava flour was poured into the boiled water with some aggressive turning using a local turning stick. The flour was turned to form a thick paste of consistent appearance. Sensory evaluation was carried out within ten minutes of preparation. A ten man trained sensory panel was raised from among the local consumers of 'lafun'. The panelists were familiar with the scoring scale and the assessment method during the preliminary training session. The samples were arranged randomly and presented to the judges in the same type of plates and each sample was coded in such a way that the panelists could not be biased by the coding system as a set of three digits of random numbers were assigned to each sample. A ten point hedonic scale was used for the evaluation of the degree of preference of the appearance, smoothness, taste, texture and non-stickiness of the products, with "0" indicating worst preference for the product on the attribute and "10" indicating highest preference. Similarly , a nine hedonic scale preference analysis was used to make panelist express their degree of likeness or dis-likeness for the products ('lafun) made from the different cassava varieties, without letting the panelist know which product was made from which variety . The means of their scores were used to determine cassava root which was most preferred for 'lafun' production. Analysis of variance was carried out as described by Larmond (1977). Table 1 shows the physico-chemical characteristics of the cassava varieties before and after fermentation . All the varieties used were found to have relatively low cyanogenic potentials. The fermentation processes were characterized by increased acid production ( increase in TTA and decrease in pH ) for all the cassava varieties. Acid production during cassava fermentation has been attributed to the activities of the lactic acid bacteria on the carbohydrates of the cassava root (Oyewole and Odunfa, 1990). In this study, no significant difference was found in the acid production profile of the fermentation involving different cassava varieties. This suggests that acid production may be dependent not on the cassava variety but on the microbial flora and the processing conditions. as earlier reported by Oyewole (1990). The fermentation process effectively reduced the cyanogenic potentials of all the cassava varieties to safe levels [0.3 - 0.7 mg HCN/100g]. This confirms earlier reports that the fermentation of cassava is an important means of detoxifying it [Mahungu et al., 1987]. Starch constitute over 80% of each of the fresh varieties of cassava used. This is in line with earlier findings [Longe, 1980 ; Oyewole and Odunfa, 1989]. Fermentation effected very low reduction in the starch contents of all the cassava varieties. The sugar, ash and protein contents of the cassava varieties were reduced in the course of the 96 hour fermentation for all the varieties. These reductions had earlier been reported to be due to a combination of leaching into the soaking water and microbial utilization (Oyewole and Odunfa, 1989). Except for the significant reduction in the fibre content of TMS 4(2)1425, there was no significant difference in the physico-chemical changes of the cassava varieties as a result of the fermentation. The pasting and cooking characteristics of the fresh and fermented cassava roots from the different varieties are shown in Table 2. The unfermented flour from TMS 30472 and TME 1 exhibited close cooking and pasting characteristics. Generally, there was no significant difference in the gelatinization time and temperature of the fermented and unfermented cassava of the four varieties investigated. There were significant differences in the cooking characteristics of the fermented flour made from the different cassava cultivators. The flour from the local variety,; ' Isunikankoniyan' gelatinizes faster than others varieties. The cassava varieties TMS 4(2)1425 requires signifcantly higher heating time to gelatinize. Consumer preference for the cooked 'lafun' made from the different cassava varieties are shown in Table 3. 'Lafun" consumers described good quality 'lafun' as one with little or no odour, having a characteristic white colour with good texture and which does not stick to the hand of the consumers .The texture of the 'lafun' from the cassava varieties varied significantly to each other. Cooked 'lafun' from TMS 4(2)1425 was found to be significantly different from others in appearance and taste. Except in texture and smoothness , there was no significant difference between the cooked product from 'Isunukankoniyan' and TME1. However, 'lafun' from 'Isunikamkaoniyan' was most acceptable to the consumers of the product. The lafun made from'TMS 4(2)1425 was least acceptable. Akingbala , J.O., Oguntimehin, G.B. and Abass, A.B. (1991) Effect of Processing method on quality and acceptability of 'fufu' from low cyanide cassava. Journal of the Science of Food and Agriclture, 57, 151 ­ 154. Akoroda, M.O., Gebremeskel, T and Oyinlola, A.E. (1989) Impact of IITA Cassava varieties in Oyo State, Nigeria, 1976-1985. Tropical Agriculture, 66 (2) 113 ­ 120. Almazan, A.M. (1992) Influence of cassava variety and storage on 'gari' quality. Tropical Agriclture, (Trinidad), 69,(4). 386 ­ 390. A.O.A.C. (1984) Official Methods of Analysis. 14th Edition. Association of Official Analytical Chemists. Washington, DC. Pp. 38 ­ 46. Blansherd, A.F.J., Dahniya, M.T., Poulter, N.H and Taylor, A.J. (1994) Fermentation of cassava into 'foofoo'. Effect of time and temperature of processing and storage quality. Journal of the Science of Food and Agriculture, 66, 485 ­ 492. Deffenbang, L.B and Walker, C.E. (1989) Comparism of starch pasting properties in the Brabender-Viscoamylograph and the Rapid Visco analyzer. Journal of Cereal Chemistry, 66, 493 ­ 499. Dubois, M., Gilles, K.A., Hamilton, J.K., Rebers, P.A and Smith, F. (1956) Colorimetric method for determination of sugars. Analytical Chemistry, 28, 350-356. Idowu, M.A. and Akindele, S.A. (1994) Effect of storage of cassava roots on the chemical composition and sensory qualities of 'gari' and 'fufu'. Food Chemistry, 51, 421 ­424. Larmond, E.(1977) Laboratory method of sensory evaluation of foods. Department of Agriculture, Canada Publications. No. 1637. 33 pp. Lees, R. (1975) Food Analysis in Analytical and Quality Control methods for the manufacturers and buyers. CRC Press. India. 30pp. Longe, O.C. (1980) Effect of processing on the chemical composition and energy value of cassava . Nutrition Report International, 21, 820 ­ 828. Mahungu,N.M., Yamaguchi, Y., Almazan, A.M and Hahn, S.K. (1987) Reduction of cyanide during processing of cassva into some traditional African foods. 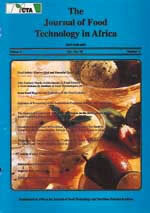 Journal of Food and Agriculture (Nigeria), 1, 11 ­ 15. Oyewole, O.B. and Odunfa, S.A. (1989) Effect of fermentation on the carbohydrate, mineral and protein contents of cassava during 'fufu' production. Journal of Food Composition and Analysis, 2, 170 ­ 176. Oyewole, O.B. (1990) Optimization of cassava fermentation for 'fufu' production. Effect of single starter cultures. Journal of Applied Bacteriology, 68, 49 ­ 54. Oyewole, O.B. (1991) Fermentation of cassava for 'lafun' and 'fufu' production in Nigeria. Food Laboratory News, 7,(2), 29-31. Oyewole, O.B. and Odunfa, S.A. (1988) Microbiological studies on cassava Fermentation for 'lafun' production. Food Microbiology, 5, 125 ­ 133. Oyewole, O.B. and Odunfa, S.A. (1990) Characterization and distribution of Lactic acid bacteria in cassava fermentation during 'fufu' production. Journal of Applied Bacteriology, 68, 145 ­ 152. Oyewole, O.B. and Sanni, L.O. (1995) Constraints in traditional cassava processing ­ The case of 'fufu' production. In: Transformation Alimentaire du Manioc. Editors: T. Agbor-Egbe, A. Brauman., D. Griffon and S. Treche, ORSTROM, Paris. Pp. 523 ­ 529. Osungbaro, T.O. (1992) Effect of differences in variety and dry-milling of maize on textural characteristics of 'Ogi' ( Fermented maize porridge) and "Agidi" ( Fermented maize meal. Journal of the Science of Food and Agriculture, 52, 1-11. Rao, P.O. and Hahn, S.K. (1984) An automated enzymatic assay for determining the cyanide content of cassava ( Manihot esculenta Crantz) and cassava products. Journal of the Science of Food and Agriculture, 35, 426 ­ 436.